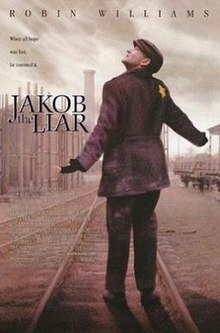 This entry was posted in Holocaust, Movie, Reviews, Trailer, True Story, War Movie, WWII and tagged Books, Holocaust, Jacob the Liar, Jakob der Lügner, Jakob the Liar, Jurek Becker, Liev Schreiber, Movie, Movie based on book, Novel, Review, Robin Williams, Trailer, War Movies, WWII. I’m not a huge Robin Williams fan–mostly because I think he’s miscast. I liked him as the creep in One Hour Photo and thought that might signal a shift in his career. He looks too well fed in this. Am I right? Funny you should say that, I liked him in One Hour Photo too. Normally he does annoy me and the movie would have been better with another actor but if you want to aim for something à la “Life is Beautiful” and for the whole family and less true to the book, then he isn’t a bad but certainly a too well-fed choice. I didn’t even notice but it’s true. I also am not a Williams fan and have a hard time watching him play himself in movies. For instance, Good Morning, Vietnam. I guess I should give it a try, but I am skeptical. I actually thought that Good Morning Vietnam might be one of his better ones but I haven’t seen it yet. I haven’t seen this and my main reason was that it stars Williams. I just don’t see him making this role memorable. I know it is a Hollywood film, but I think they could have tried to cast it differently. I am happy to learn that it is based on a book. I didn’t know that. I think I would prefer to read the book and skip the movie. The book is far better ad really worth reading. It’s not a bad movie but I would have preferred another actor too. who do you have in mind? and what’s wrong with Williams? I find he overacts often, too exaggerated. Someone more sober would have bee better but hard to say who. I hadn’t heard of, thanks for mentioning it. I have never heard of this before, compare to Life is Beautiful, which one is better in your opinion? I totally agree with the book movie thing, it is a difficult matter and always back to individual opinion. Life is beautiful is the better movie but I almost liked this story better and the end of it.